The Battle of Cable Street has gone down in popular memory as the decisive moment when British fascism was confronted on the streets; a victory for anti-fascists which proved once and for all that we were the majority and would not tolerate fascism here. Certainly, the supporters of the British Union of Fascists were heavily outnumbered, with fewer than 2,000 of their supporters being faced down by over 100,000 anti-fascists. It is also the case that in the aftermath of the protest, the left presented the events of 4 October as an enduring victory. The Daily Worker produced a special booklet, ‘They Did Not Pass’. Writer Frank Griffin published a novel, October Day. A decade later, with young Jewish activists determined to confront Mosley’s postwar Union Movement in opposition to leaders of the Communist Party (CP) who saw such activism as ultra-left, the CP commissioned Mile End MP Phil Piratin to write a history of the events. His book, Our Flag Stays Red, both commemorated and tamed Cable Street. He presented the victory as the consequence of the Communist Party imposing “strict discipline” on the turbulent class fighters of the East End. The Red Flag of his title, Piratin explained in an epilogue, was held by the Communists, and carried in Parliament in their work (alongside the Attlee government) to extend the welfare state. Given the scale of what was at stake, the historical record has left surprisingly limited evidence of who exactly was at Cable Street and what motivated them. Richard Bellamy, Nellie Driver and other supporters of the BUF, acknowledged Cable Street as a set-back while praising the very few fascists who were able to engage in hand-to-hand combat with anti-fascists. (You can see some of those clashes at 1 minute 35 in: here). The East End remained sympathetically to Mosley, they insisted. Above all, the most popular approach taken by BUF speakers after 1936 was to blame the Cable Street “mob” on a bankers’ conspiracy, with one fascist John Beckett maintaining that “Jewish Finance” had paid for the Communist crowd. These and similar accounts maintain a contempt for the left that goes back to interwar fascism – and a fundamental inability to see the Jewish population of the East End as fully human. Although the Communist Party called on all its London branches to take part in the Cable Street protests, and although film of the day shows several demonstrators giving a Communist clenched fist salute, the CP was a minority. Even if the party had been able to mobilise its entire national membership, they would not have been more than at most one in twenty of those taking part. Who, then, was there? One way to see Cable Street is at the forerunner of a kind of community mobilisation which was seen repeatedly in the 1970s. IE a generation of first and second-generation migrants identified with the political left, drawing on a combination of left-wing traditions predating exile, plus their own situation as both workers and victims of racism. There are a huge number of memoirs (plus novels, plays…) from the East End which confirm this picture. The East End had been a centre of organising by anarchists going back to the unemployed protests of the 1880s, by socialists from the 1889 dock strike to the Poplarism of the 1920s, and by Communists, starting with Sylvia Pankhurst’s campaign among East End women and going on from there to the generation of syndicalists who followed her into the CP. In all these different periods of left-wing organising, Jewish socialists had been prominent. They were, in this way, the forerunners of the British black community which Sivanandan saw emerging among British Sikhs at Southall in 1979. On this account, Cable Street was the return of a debt of Jewish-gentile solidarity, which could be traced back to the effects of the London Dock Strike in 1889, in sparking a near insurrectionary general strike in the local area with dozens of workplaces (many of them Jewish) turning out in support. Because the garment workers had supported the dockers in 1889, so the dockers turned out, fifty years later. There must be some truth to that explanation: the sheer size of the crowds points against them being a purely Jewish mobilisation. The standard estimate of the total Jewish population of Britain in the 1930s is 300,000 people: with perhaps half living outside London, and half of the remainder being too young or too old to have been at Cable Street. Just from numbers alone it seems unlikely that more than half of the people there were – or could have been – Jewish. Yet, of the groups named by Beckman, there are precious few sources to corroborate that there were Welsh miners present on 4 October or that shipbuilders came in a delegation from the North East. The one group we know for sure were there are the dockers, but even then the sources are thin: Jack Dash says in his autobiography that he was there, but gets the date wrong. Could you imagine one of the many young Jews who were at Cable Street and later recorded their memories of the day – a Harold Rosen, perhaps, making the same mistake? Back in 2016, the Irish Times ran an interview with Cable Street veteran, Communist councillor and lifelong socialist Max Levitas describing how he had stood at Cable Street alongside his father and other members of their family. Levitas’s parents had met in Dublin having escaped pogroms in Latvia and Lithuania in 1913. They then participated in strikes in Dublin, where Levitas was born. He described the participation of dockers at Cable Street. No-one could criticise a mainstream paper for taking such care with working class history. But in speaking of the dockers, Levitas was talking about people who could draw on different experiences to his own: the war for independence, the part played by the Black and Tans, the history of anti-Catholic sectarianism in Liverpool and Birmingham and London. These experiences could give rise to a social democratic consciousness (as in post-1918 Liverpool, where the Labour Party which printed its leaflets not in red but in purple) but its heroes were different from those of the Jewish East End tradition, seeped as it was in Bundism, anarchism and Bolshevism. When Levitas told his interviewer, “We knew the Irish would stand with us,” the “we” is the Jews of Cable Street. Born as he had been in Dublin, for Levitas, the Irish dockers remained a “them”. There is a gap in our knowledge of the events. Henry Srebrnick’s London Jews And British Communism provides a collective political history of the Jewish East End in the 1930s and 1940s, Thomas Linehan’s East End for Mosley does something similar for the BUF, but no historian – as far as I know – has ever written the equivalent community study of the politicised, Catholic, dockers of the East End and their families. Think of the Jewish East End which produced Arnold Wesker’s Chicken Soup with Barley – and ask yourself what the Catholic equivalent of that play would be. I wonder if we will ever fully understand the protest, until we have that play (or its equivalent). If it right that Cable Street was first of all a community mobilisation of young and left-wing Jews, and only then drew on support from other workers on a class basis, that understanding might provide a context to one feature of contemporary fascism and anti-fascism: for the last 18 months, the far right has had considerable success in mobilising events in the “deserted zone” of Whitehall at weekends. The best anti-fascist mobilisations in history – Cable Street, Lewisham, Walthamstow – have come about where the left was able to mobilise beyond its usual numbers and bring in wider numbers of people, through a cultural or a community mobilisation. Whether by accident or design, the far right has not been giving us that opportunity. Whether through a new cultural campaign of our own, or by some other means, anti-fascists need – urgently – to find a way of mobilising which makes up for that gap. 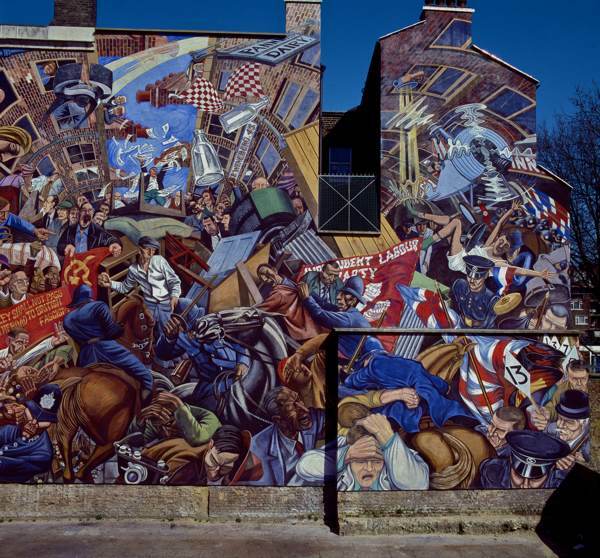 The battle of Cable Street, which took placed this day in 1936, has been commemorated in songs, plays, murals and children’s fiction. Not as well known, but no less compelling, is the modernist novel written around the events of Cable Street – Frank Griffin’s October Day, originally published in 1939 and republished three years ago by Five Leaves Books. The protagonist Joe Slesser begins the book as an unemployed worker who is in constant tension with his wife. Going to Cable Street more for excitement than out of any political understanding at all, he meets Communist protesters and returns home having been won to voting Labour, which enables him by the novel’s end to find work (previously his anti-union views caused him to refused to work for the council) and rebuild his marriage. In between, the novel contains a range of characters including a woman ground down by poverty and contemplating suicide and a bus conductor who takes pity on her. The book is written in short vivid scenes reminiscent of the cinema of its time, when single reels of film could last only around ten minutes. It is a mark of the different literary culture of those times that it was published and proactively marketed by the relatively mainstream house of Secker and Warburg (previously the publishers of Kafka and Lawrence). One point Griffin well understood was that socialist fiction is at its most interesting when it is at its most grotesque and unreal, and its dullest when it is merely a narrative of demonstrations. In art as in life, socialism is capable of degeneration into a kind of identity politics where the form (conferences, marches, pre-printed placards) overwhelms the content. The majority of readers of fiction, encountering a story of a protest do not intuitively respond by thinking to themselves “how exciting”; if they did, they would go on more marches themselves. And therefore a realism which revolves around repeated descriptions of uplifting demonstrations will not be read by its audience in the way that an activist author intends: a story of personal and public liberation. Griffin solves this by making his marchers accidental demonstrators, and giving them an antagonist worthy of great art. Helen Stroud is a friend of politicians and financiers and moves in a charmed circle where Mosley’s name is seen as wholly legitimate. She is desperately aware of the passing of her youth, which she attempts to preserve by a relationship with a young and ambitious police officer from a thwarted middle-class background. Contemptuous of the demonstrators and despised by her own lover, she is maintained only by her general malevolence to the world. Eighty years later, of course, the Strouds are still in charge and the left still in need of further Cable Streets. 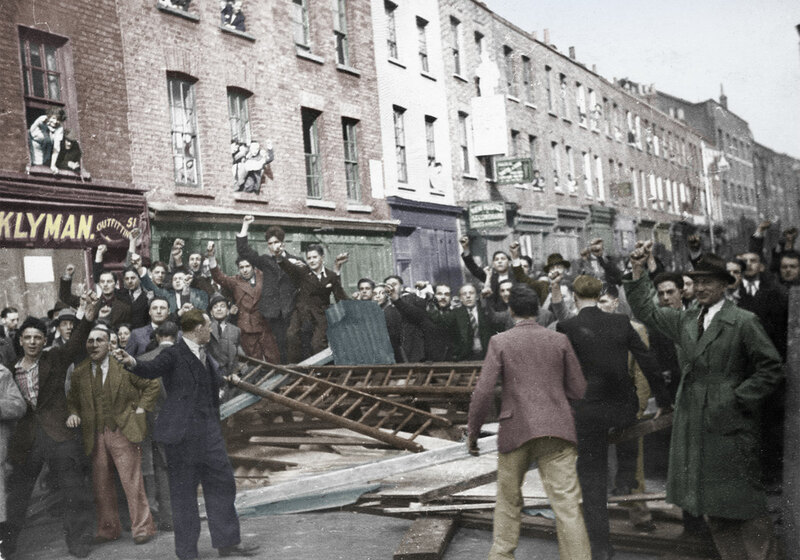 On 4 October 1936, fascists and anti-fascists clashed as 1,900 supporters of Oswald Mosley’s British Union of Fascists (BUF) attempted to march from the City of London through London’s East End. Mosley himself was driven to the scene in a bullet-proofed Bentley; he wore a peaked cap, an SS-style jacket, jodhpurs and knee-length jackboots. On arrival, he inspected his supporters and took the fascist salute from them. His way was blocked by a crowd of more than 100,000 anti-fascists at Gardiner’s corner, the main route into East London. Up to 6,000 police officers tried to disperse the anti-fascists, with mounted officers hitting indiscriminately at the heads of demonstrators with wooden batons. When their attempt to force a way through for the fascists failed, the police attempted to find an alternative route for them through the narrow, residential streets to the east of Gardiner’s corner, only to find that these were blocked by barricades, including an overturned lorry. The Metropolitan Police Commissioner Sir Philip Game spoke to Mosley. “If you fellows go ahead from here, there will be a shambles”, Game said, “You must call it off.” “Is that an order?” Mosley asked; Game answered, “Yes.” Fascists cried out in disappointment when they realised they would not be allowed to march. Mosley led his supporters through the Sunday streets. He would not even address them at the end. The BUF procession finally dispersed near Charing Cross. To understand Cable Street it must be remembered that this was the second of the two key moments in the anti-fascist struggle of the 1930s. The first had taken place at Olympia, on 7 June 1934. For two years prior to Olympia, Mosley set out to win the support of disgruntled Conservatives. Mosley’s best known backer was the press baron Lord Rothermere whose Daily Mail printed pro-BUF headlines (“Hurrah for the Blackshirts”), publicised Mosley’s meetings, and ran competitions offering free holidays to those who joined the BUF. By the summer of 1934, the BUF reached its peak membership of 50,000. Most of its members were middle- or upper-class. The idea of Olympia was to put this organisation on show in a mass rally of tens of thousands of Blackshirts. Anti-fascists disrupted Olympia by attempting to heckle Mosley. They were picked out with electric lights and beaten by the BUF stewards. Yet the violence of Olympia deterred Mosley’s passive supporters. Rothermere himself initially applauded Mosley for Olympia, before one month later ending his support for the BUF. By October 1935, the BUF’s membership had fallen to 5,000. It was in this same month that Mosley settled on a new tactic, of seeking working-class support in the East End. The members recruited in the twelve months leading up to Cable Street were poorer than their predecessors. They included large numbers of workers in declining trades such as clothes-production or furniture-making, some of whom were in direct competition with Jewish labourers working in the same industries. The BUF used force to silence its opponents. Storm Jameson was a journalist present at Olympia. He described watching Mosley repeatedly pause his speech for intervals of up to six minutes so that the crowd could watch anti-fascists being kicked and punched without restraint. “Slowly”, Jameson reported, “we all understood that it was done to allow the Blackshirts to make a mess of the interruptor.” Violence against the left was not accidental; rather it was a defining purpose of fascism. Again, after Cable Street was over, members of the BUF were found to have discarded iron bars, broken bottles and chair legs wrapped in barbed wire. Newsreel descriptions of Cable Street suggested that the East End had only narrowly been saved from “bloodshed on a scale more terrible than London has ever witnessed”. Police reports state that 73 police and 43 private citizens required medical treatment afterwards, although this appears to have been a dramatic underestimate, with many anti-fascists relying on help given at field medical stations staffed by volunteers. Yet despite the violence of the BUF; the target of the police was anti-fascism. Of the 85 arrests made by the Hackney police, 79 were of anti-fascists. For the best forces of the left, Cable Street was never just a London or a British struggle. Rather it was an expression, at close hand, of a worldwide war of ideas. In July 1936, four months before Cable Street, units of the Spanish Foreign Legion under the leadership of General Franco had begun an uprising against the elected Republican government in Madrid. Workers took collections for the Republican side; exiled Spanish children were welcomed into working-class homes. Many young workers volunteered to fight in Spain. The slogan of Cable Street, “They shall not pass”, was borrowed consciously from Spain. The fascist plans for Cable Street were announced just a week before the march was due to take place. The BUF’s plans caught off guard those socialists and Communists whose eyes were focussed on events in Madrid. The London District of the Communist Party had intended for some time that the 4th October should be a youth rally in Trafalgar Square for Spain. The London Communists responded to the news of the BUF march by insisting that their event should go ahead as planned; Mosley could be well opposed by a demonstration some three miles away from his. But Communists in Stepney had other plans. A petition was launched calling for a ban on the fascist march, which was signed by some 70,000 East End workers. The “official” Communist leaflets continued to circulate, but now overstamped with instructions calling upon activists to assemble not in Trafalgar Square but in the East End. Before Cable Street began; the Labour Party opposed the protest. In its immediate aftermath, Labour sought to claim the credit for its success. Soon after it had finished, Labour’s message was again that it had been the work of troublemakers. On the Monday after Cable Street, the Herald described the event as a popular victory, “Street battles stop Mosley March”. Labour shadow Home Secretary Herbert Morrison used the conference to denounce both left and right, and to call for a ban on political uniforms. With Labour’s support, Parliament passed the Public Order act giving the police the power to ban all marches, not just racist or fascist ones. The Act was first used in June 1937 to ban demonstrations in the East End. The first event to be cancelled was a recruiting march for Bethnal Green Trades Council. The most far-sighted of the Communists could see that defeating the BUF would require far more than just physical confrontation. The BUF had to be challenged in the areas where it claimed the greatest support. For much of the 1930s, the Communist Party was smaller than the BUF. In 1930, the CP’s membership had stood at just 2,500, although this figure grew through the decade. In 1934, the BUF outnumbered the CP seven to one, and even in 1936 the BUF had more members than the CP in the East End. The Communist response is described in Our Flag Stays Red the memoir written after 1945 by then the Communist MP for Stepney, Phil Piratin. In June 1937, Communists living at Paragon Mansions in Mile End heard of the threatened eviction of two families who turned out to be members of the BUF. The Communists agreed to support them against eviction. The tenants barricaded the block against the bailiffs, who were held off for two weeks. As Piratin wrote, “We were now supplementing our propaganda with positive action. The kind of people who would never come to our meetings, and had strange ideas about Communists and Jews, learnt the facts overnight”. The Communists targeted estates seen as no-go areas for the left. This political struggle, as much as the physical victory a year earlier, isolated the BUF. Defeating the fascists politically was slow work. Just a week after Cable Street, 150 fascists congregated in the East End. They attacked Jewish shops, and two bystanders were thrown through a plate-glass window. This fascist revival continued until local elections in spring 1937, when BUF candidates won 19 per cent of the vote in North East Bethnal Green, Stepney and Shoreditch. Yet this result needs to be placed alongside derisory BUF votes in the same elections in such former fascist stronghold as Leeds, Manchester and Southampton, and of reports of BUF branches ceasing to exist all over non-Metropolitan Southern England. Two processes appear to have been at work. First, the BUF’s increasing notoriety as the “anti-Jew” party won it some recruits in the East End while demoralising members elsewhere, for whom anti-Semitism was just a component and not the most important part of the fascist message. Second, the fascists were cannibalising their own organisation in order the mask the scale of their defeat, pulling in members from all over England to shore up the East End organisation. In doing so, they were weakening their party everywhere else. After Cable Street, British fascism was never as strong again. Seventy-five years later, the enemy has in some respects changed. The fascist model of the 1930s has splintered; there is no longer a single fascist type. In France, Italy and Austria, there has been a transition away from street politics. In Hungary, the dominant party on the far right is Jobbik, which employs street marches and uniforms and has an open ideological debt to the inter-war years. The British National Party represents an electoralist path. The one public space which the BNP has attempted to occupy over the past decade has been its annual Red White and Blue festivals. These had to be abandoned following protests Codnor in 2009, when the BNP was outnumbered and besieged by demonstrators from Unite Against Fascism. The BNP did poorly in the 2010 and 2011 elections and is currently in retreat. One national newspaper The Daily Star has campaigned actively for the EDL, calling on its leaders to form the EDL into a political party. The police meanwhile have been no better than they were in the 1930s. The lesson of Cable Street is that despite the press and the police, fascism can always be beaten. But that requires our side to get organised.